Pre show Interview with Artist Nation TV and Lauren Concar , GSFF Executive Director & Heather Brittain O’Scanlon, actress, Board Member. The purpose of this capsule review is to light fires for planning next year to attend and perhaps some instillation of guilt, regrets, why you were not there this year. 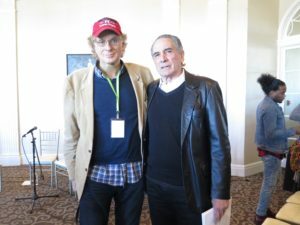 A wondrous event; New Jersey’s own film festival by the ocean, replete with pomp, excitement, energy, film makers, actors, actresses, industry insiders, deal makers. Represented; the independent film industry. I love the word independent. It makes me think of 1776; spirit, original colonies, strong belief systems, New Jersey, expressing, declaring, creating, proudly showing, winning, competing, producing, directing and the togetherness, cohesiveness, knowledge of participants. 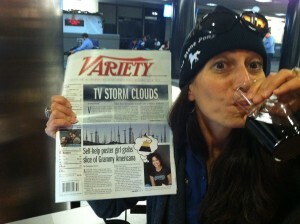 Metaphors, verbs, visualizations; whatever, the Garden State Film Festival delivered a wonderful weekend. 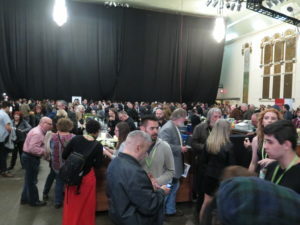 Friday Night Gala Cocktail Party and First Screening brought hundreds to Convention Hall. My press credentials issued for my work with NJ Discover and Artist Nation TV headed by Noelle Ciumei, doing feature interviews capturing excitement and energy. To me, this party was like a boardwalk amusement park, some fantasy rides, adventure, future, past, present; and the props like people, electricity, business cards, appointments, promises, future think, projects, exigencies and realities. 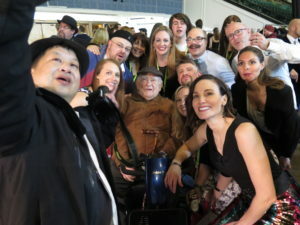 A great accessible party for pictures, selfies and red carpets. Food, plentiful, imaginative and fun. I’m not a foodie person, but the pretzel, with perhaps the best brown spicy mustard ever, had me perseverating for days. Accessibility evident. 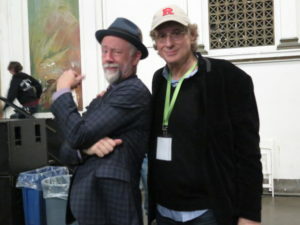 I stopped Xander Berkeley, who was honored with Lifetime Achievement, eating with chopsticks, and moments later, we were sitting, talking, about his prolific career, but with such ease, as if we’ve been friends for decades. He loves the notoriety aspect, lack there-of, so he can sit at a sidewalk café and draw/sketch people walking by. He called it flying under the radar. He talked about living in the now, his spiritual side. There is a power to living in the now, an inner peace. How delightful he was. Of course, it was time to get back to photo-ops and selfies. 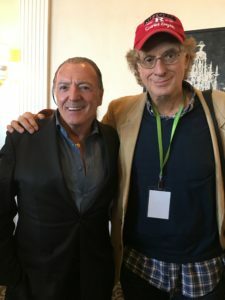 Ed Asner, on the Honorary Board, Armand Assante, MVP, honored for his continuing support of the Festival, Christopher Lloyd, a Festival honoree with the Beacon Award, were all mixing in. Such graciousness, a particulate of the energy of this Festival. 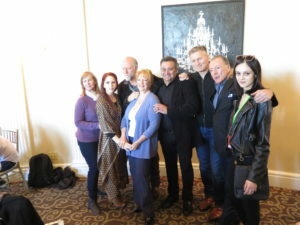 Armand Assante, Christopher Lloyd and Xander Berkeley all premiered their films. 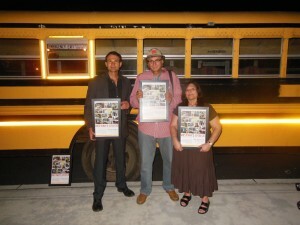 Check out www.gsff.org. On a lighter note, three women excitedly stopped me, “Wait, you’re an actor from Seinfeld. The raisin episode! Can we take a picture with you?” It took me a minute of convincing that it’s not me. But they still took a picture with me. A young woman introduced herself. My projection of being a journalist; the blazer, Rutgers hat. Stephanie Angel, from Angelight Films, recipient of the 2018 Garden State Film Festival’s Broader Vision Award for Filmmaking Dedicated to Greater Good told me about her work, which gives children with brain and spinal chord tumors a chance to express themselves on short films. This blew me away, such that I’ll do a special article on NJ Discover. People need to know. Part of the reason to believe in the Festival; to illuminate, share and learn. Next up, the film premiere of Armand Assante’s riveting, powerful film, ‘The Wanderers-The Quest of the Demon Hunter’ in the Paramount Theater. Of course, I loved it, engrossed, carpeted to on site locations in Romania, loved the Q and A, honest, engrossing, revealing. Would love a sequel; I told that to Armand directly. Saturday, with my Rutgers mentee student Marisa, and co-host of NJ Discover LIVE TV Show, Tara-Jean McDonald Vitale, we attended the showing of nine short film entries, animation, comedic, heavy, imaginative, sad, uplifting, but part of this brave new world of accomplished independent talent. Being a former salesman, the film ‘Death of an Umbrella Salesman,’ resonated with me as it conjured up Arthur Miller and Charlie Chaplin as the Tramp. with actor Armand Assante. 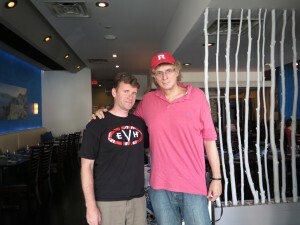 We talked about his film The Wanderers-The Quest of the Demon Hunter and my para-normal activity. Next the anticipated Panel discussion, Actors on Acting with Monica Henreid, moderating. Her father, one of my all-time favorite actors played Victor Lazlo from ‘Casablanca.’ Present were Armand Assante, Xander Berkeley, Garry Pastore, Chance Kelly and Oana Marcu, who played the ‘heavy’ in ‘The Wanders-The Quest of the Demon Hunter.’ A great hour. I loved Monica’s question, “Who Inspired You?” For the Q and A., I needed to know about their handling of rejection. Yes, this capsule, a bit long, but needed for reality and enticement, memorization to get you down here next year. 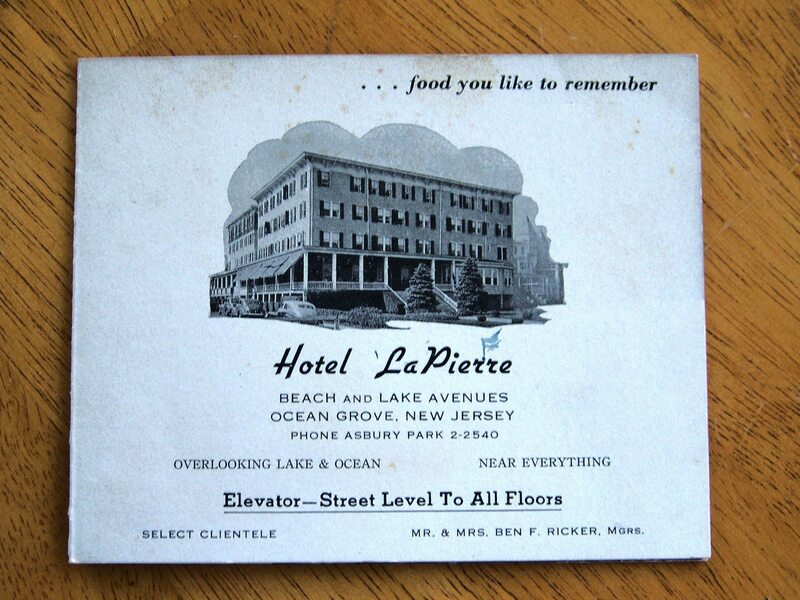 It’s “good stuff” being in Asbury Park, smelling ocean air, popcorn, seeing movies, dreams realized, partaking of all that Asbury offers, food, music, boardwalk, escapism. Actually, a capsule is something you take in the morning or at night, then call me next year, in the morning. We’ll go to the Festival together. 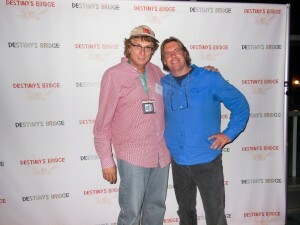 with the eloquent and accomplished musician Michael B.
I’ve just finished watching film maker Jack Ballo’s ‘The New Destiny’s Bridge 2016’ for the second time in as many days. I had to; it’s above and beyond being a journalist, but being more a humanist. I reckon it would’ve been just as easy to take my review of the first version a couple of years ago, dress it up a bit with some Roget’s Thesaurus substitute words and present it to you. Who’d know? Better to take that review as it was, and maybe re-issue it down this paper a spell. Because much is the same. It is Jack’s enduring commitment, devotion to the homeless people of Tent City and to humanity’s unending scourge of homelessness that is so evident in this beautifully crafted story. It’s a candle that burns beyond its oil. There is no beauty in homelessness, but in the soul of people who see it, and try to solve it. There’s a wooden horse outside my window. I’ve just ceremoniously put on my western hat and ran outside to jump on. I’m galloping into the sunset of introspection and homelessness. We are a funny species. I’m not laughing. I think we’ve been in the Garden of Eden all this time; we just don’t know it. There have been fellow humans talking about homelessness, poverty and hunger for a little over 2000 years. It doesn’t go away it just gets worse, on a grander scale. I don’t know anymore. I never did. 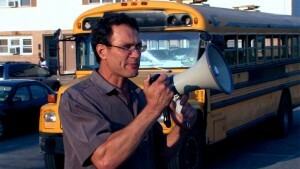 We need the Jack Ballos’ to keep fighting, sharing, and moving us emotionally and spiritually. I worry about a recent study by a couple of government scientists that give the good old human species about 30 more years. They came up with some formulas taking into account food, water, climate change, energy, and the most important, social unrest. How is it the top 88 richest people in the world have their combined wealth exceed the poorest 3 ½ billion fellow humans. This creates social unrest all around the world. Angelo keeping warm in his tent. It still was so very cold. Homelessness is part of the formula. Basic human rights of food, shelter and medical care from a very rich world. 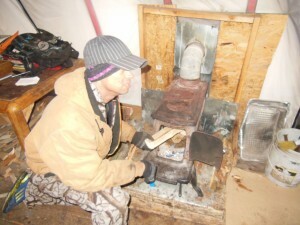 My story of enlightenment begins four years ago when I never understood homelessness. It was abstract, distant and the subject of a two minute NYC TV segment a week before Christmas. It was very cold and someone living in a cardboard box died from exposure. I felt bad. I do know that every human starts out life the same way. 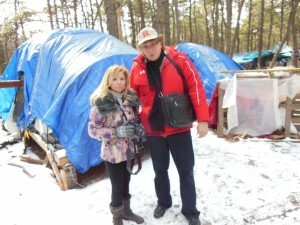 Four years ago, my new friend Sherry Rubel took Tara-Jean Vitale and me as NJ Discover reporters to visit Tent City in Lakewood. It was another cold snowy day. We met Minister Steve and eventually Jack and many residents. Tara-Jean and I debated homelessness in the car going home that day. Tent City was 22 miles from our comfortable insulated suburban worlds. I’ve never been the same since. I needed to feel, be involved and understand and to be more human and less suburban. I entered a brave new world of social conscience. That’s why I marvel at Jack Ballo’s work. It’s all fitting and proper that I reviewed the first film a few years ago. I love the institution of movie making and its illumination of our world with the ability to teach, educate, and bring our world closer together. Hey everybody, go see this movie and set yourself up to feel what it’s like to be homeless and be filled with despair. Jack painstakingly took a different approach to storytelling of Tent City from the first version. He looks more into the lives, souls, hopes of the residents. They’re just like me and you; no difference except circumstances of privilege and perhaps luck. There is a theme more easily recognized in the new version; the desire of people to have basic shelter, self-respect and dignity. President Lincoln lived in a log cabin and he was fine with that. In essence, it was a tiny house and the film exposes us to the promise of tiny houses; the concept growing in practicality every day. And our friend Sherry Rubel very much involved in the state wide quest to build tiny house communities. 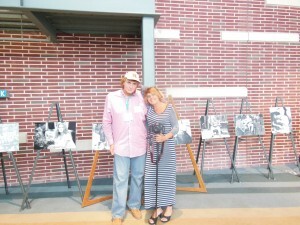 with photographer and Tiny Houses activist Sherry Rubel at an exhibition of her Tent City photography. The movie themes carefully the importance of making people feel they are part of society with its concomitant feeling of self -esteem. Jack Ballo strives to teach us that. Inherent in Jack’s film, is the message to be promulgated; we all need to see this; to feel the pain of homelessness. One of the most moving scenes for me (Jack was brilliant in documenting this) was the lit Christmas tree at night, ‘The Little Drummer Boy’ playing gently. The scene could’ve been anywhere. A simple beautiful Christmas scene. 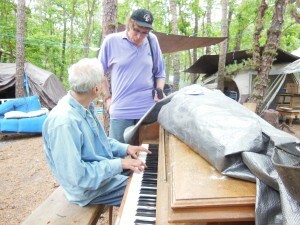 But it was a homeless tent in obscure corner of Tent City. Riveting for me. It should be riveting for you. Homelessness hurts us all. I liked the slow seasonal transition from the warmth of summer to the desolation and futility of cold winter. It was a passage for me. When I let my guard down and drifted into the lives of these precious people, Jack reminded us that the courts were constantly after Minister Steve and the residents. There are many scenes when cops in traditional uniforms or shirts and ties are there to arrest and act on the wishes of the town. Eventually the township and the county won out. I remember going to court with them at Ocean County Court House and hearing the judge’s decision. 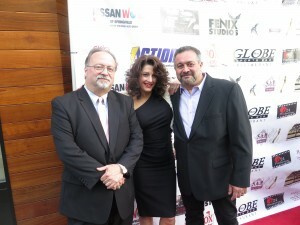 after the first Destiny’s Bridge Premier with Rosemary Conte and Minister Steve. It was Rosemary’s Easter Sunday Concert 5 years ago that first made me aware of homelessness close to home. Of all the towns in New Jersey, they walk into Lakewood and set up Tent City. I was honest with myself. If Tent City appeared a mile from my house how would I feel? How would you feel? Is there any suburban town that would welcome them? I am upset with myself. I’m not perfect. Jack’s film continually makes me think and feel. It will do that to you and carpet you through many human emotions. So go see it and celebrate humanity’s hope and promise as well as the harsh realities of our existence. Jack leaves many uncovered, undraped soulful mirrors for us. Thanks Jack. I just got off my wooden horse. My hat is gone. I brushed the suburban dust off. This article is comprised of three distinct sections. 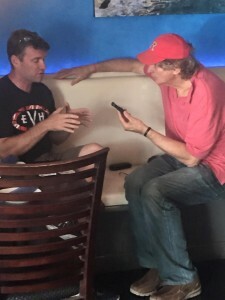 Firstly, my experience on the Red Carpet last Friday May 20th evening in Asbury Park at the House of Independents; noting one of my pastimes is absorption of extant energy fields at special events. I take a couple of deep inhalations, pinch myself, and whisper, “look at where I am, Mah.” I was thrilled to have been invited as a journalist. Secondly, although I am just short of a light year away from Siskel and Ebert, I will construct my review of the film. 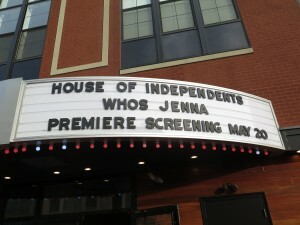 “Who’s Jenna…. ?” in my own inimitable style. Thirdly, I will reprise my article which appeared on NJ Discover last summer after I spent a morning on the Somerville, New Jersey set of the film. It’s a funny thing how fast you can become an energy barometer at certain events. 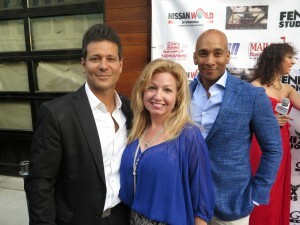 As soon as Tara-Jean Vitale, co-reporter and TV host with me at NJ Discover LIVE, arrived on Asbury Park’s Cookman Avenue House of Independents, a lengthy Red Carpet and backdrop secured along the façade, we both knew it was an electric night at the Jersey shore. We observed the early guests, splendidly dressed, were intermingling, smiling, hugging and posing. Yes, there was a certain air. The more guests arrived, more scenes of joy and hugs. There were no ‘airs’ in the air around the theater. People were really glad to be there. Bert Baron, (recent NJ Broadcasters Association Hall of Fame Inductee) program director and morning drive show host from WCTC (1450 AM) was formally interviewing, freeing me to photo, absorb and mingle. 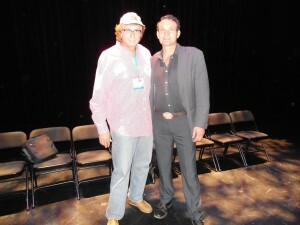 Tara-Jean and I chatted with the film publicist and Lady in Red, Laura Madsen. She did good creating a sold-out event. By 7 PM, there was a flow through and around the Red Carpet of hundreds of people. The cast arrived, euphoric and accessible. What I noticed when I spent time on the set and when some cast and young director Tom Baldinger appeared on NJ Discover LIVE TV SHOW and right in front of me on the streets of Asbury Park was that the cast and crew really liked each other; it was a real warmth, affection and respect. I love hugs. I loved watching the cast at their premiere. I sensed the chemistry I was watching would translate to the film soon to be seen. Suddenly a gust of wind blew a guest’s skirt over her head in a scene remindful of the iconic Marilyn Monroe picture. I actually caught it on camera (with proper permission). I sensed a true Hollywood evening. Cars on Cookman slowed down to check all the excitement. Slowly, the hundreds of guests, hugely anticipatory, made their way into the theater. I’m jumping now to after the film. Cast and crew sat on stage graciously sharing and answering questions and always broadly smiling. The audience loved this. 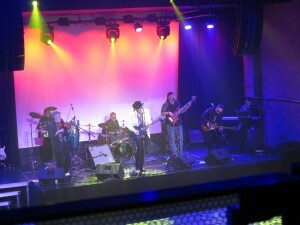 Then the iconic band, Slim Chance (Mario Casella) and The Gamblers, who did some of the original music in the film, performed at the after party. I’ve loved this band for years. They are simply electric just like the entire night had been. I moved to the front row while I had the chance. People started dancing. The cast were still hugging and posing. Then Slim Chance and The Gamblers performed “The Power.” One of my favorites. I pinched myself again. I’ve got a long history of movie watching and appreciation. It’s quirky and obsessive. Ten years ago, I was watching ‘Casablanca’ for the 44th time and at the last scene, when Bogart shoots Major Strasser, Claude Rains picks up a bottle of Vichy Water, 1942’s version of our bottled water. Rains throws the bottle into the garbage. I let out a scream. There was a novel in my head in that one second. 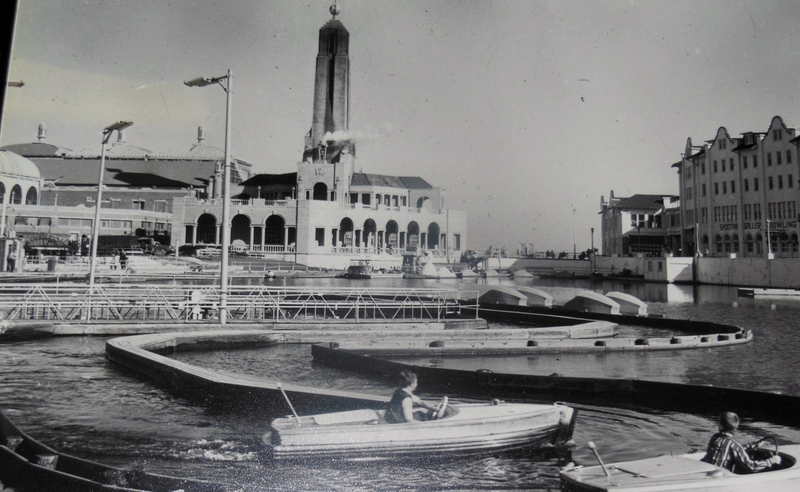 Five years later, ‘Vichy Water,’ my first novel was published. I tell this story here to dramatize my affection with movies and how powerful an influence in my life. Over the years, I’ve developed my personal movie rating system. It’s simple enough and it works. I judge a movie by whether I would see it again; simple. I’ve seen ‘The Godfather’ again and again(embarrassed how many times). ‘Casablanca’ those 44 times. Sometimes I’ll see a movie again just for a particular scene. Yes, I’d see ‘Who’s Jenna……?’ again. This was a delightfully funny film with adult film references, a little blackmail, frenetic dialogue (and well delivered) and romance. Without giving too much away, Bill Sorvino’s character, Jonathan has a girlfriend. His best friend, Andy, is obsessively, therefore comically convinced she looks like an adult film star and that leads to comedic romps. The plot thickens with a ‘familial’ twist. I appreciate sharp dialogue in preciously funny situations. Tom Baldinger, writer, director, delivers that. Some of the scenes were priceless like the old credit card commercial. That’s why I’ll see it again. The acting ensemble is quite accomplished which translates (for me) to a healthy infusion of their improvisational/ad libing skills in the filming. You can sense they’re having fun together filming and embellishing. Tom, I get the feeling openly welcomed their ‘addition’ skills. I’m a facial expression guy. I pay attention to faces in situations. Their acting gives me my facial expression fix. It’s there. 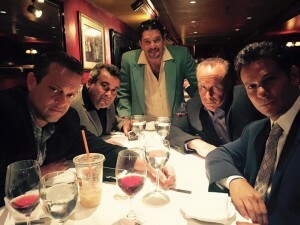 Props to this special cast including Tracey Birdsall, Bill Sorvino, Joseph D’Onofrio, Garry Pastore (who just makes me laugh throughout film), Edwin Guerrero, Lenny Venito, Vic Dibitetto, Michael Tota, Jill Christy Reiss and cameos including The Sopranos Vincent Pastore. I’m a Jersey guy since birth. I love the fact it’s a Jersey film; familiar sights and sounds. 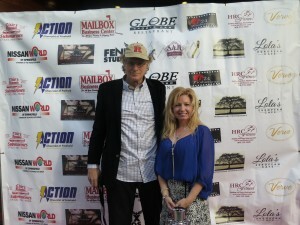 with film public relations & the Lady in Red blogger Laura Madsen on the set of ‘Who’s Jenna…. ?’ last summer. Hooray for social media, networking and circles of commonality. 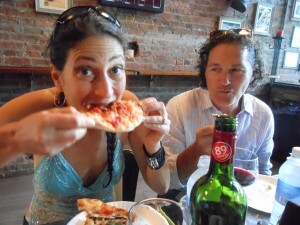 For the last several years, Laura Madsen, publicist and innovative writer/blogger at http://www.theladyinredblog.com/ and I have travelled in similar circles of commonality (as I call it). Our energies and passions emanate from Jersey life and the arts. If you’ve read my musings over the past few years, I’ve postulated that Jersey has become the pop culture capital of America and Laura is always at the epicenter. For verification of the postulate, just look at ‘The Soprano’s’, ‘Boardwalk Empire’, “Jersey Boy’s’, ‘Jersey Shore’, ‘Jersey Housewives’, ‘Garden State’, and ‘Jersey Girl’. 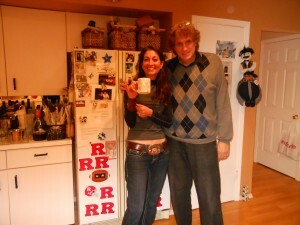 Laura and I never had the opportunity for the sharing of notes and synchronicities; we never met formally. The next decision for me was where to surface for the best absorption opportunity. 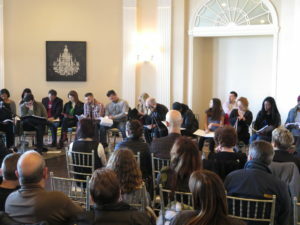 The filming was taking place at the Lakewood Country Club for an on-location golf scene or the following day at Verve Restaurant in Somerville. I surmised that it’s best not to hang around a hot golf course as Jersey was in heat wave, so I opted for the cool basement confines of Verve for the shooting of a dinner scene. 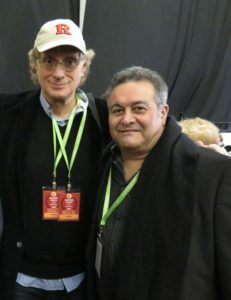 And I’d get a chance to hang a bit with actor Garry Pastore; I’ve been a fan for years. Time constraints of being on set and getting a few minutes to chat (at the break) with director Tom Baldinger made me formulate a direction I wanted to take with this coverage. I’m quick to admit that my experience of being on sets is somewhat limited although I was on set back in the 90’s with Meryl Streep, William Hurt and Renee Zellweger and wound up in the Christmas scene in ‘One True Thing.’ My focus for “Who’s Jenna…. ?” was the art of detail and precision in the film making process. Laura’s phone messaging last Wednesday morning got me to Verve’s rear parking lot (on foot), through a rear kitchen door, down a steep stairway, through a narrow hallway to a basement dining room, filled with tables and patrons (all actors). I never asked if this was an active part of the restaurant or just the basement set for a very funny scene. 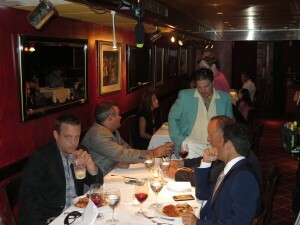 Seated at a large table, with cameras aimed, were actors Garry Pastore, Lenny Venito, Vic Dibitetto (also a very funny comedian whom I saw recently at Count Basie Theater at a Frank Sinatra Birthday Party), and Bill Sorvino, playing the lead role of Jonathan Burke. Next, Laura introduced me to the film director, Tom Baldinger; first and lasting impressions were that of an affable, intense, creative, focused force in the universe. It’s funny how fast you can “size” people. Waiters started bringing steaming plates of pasta, meat balls, chicken and foot long sausage in front of the seated actors; it was 10 AM. Someone yelled, “Get the Dunkin Donuts coffee cup off the table.” Actor Michael Tota introduced himself. He and I have been part of central Jersey concentric circles; we never met live, but knew of each other. The basement area was relatively small; an additional eight tables or so had ‘diners’ (actors) to make for a perfectly realistic restaurant set; the table next had a woman and her young daughter. The small room size and 90-degree outdoor heat made the set challenging. I watched the crew fill the four actors’ wine glasses half-way with grape juice. The wine glasses would be an interesting focus for me; the exact level of the juice in the glass was maintained for the next 94 minutes (multiple takes) that I watched from the rear side behind the cameras where Laura and I were positioned. As they were ready to shoot the scene, I heard “Quiet on the set.” I smiled. This was real. more from on the set & that funny scene. I won’t give much away but the scene was hysterically funny as the four actors ate (pretended to eat as the sausage maintained its great length throughout), drank, conversed and laughed. I love watching eyes of the actors moving from person to person; just that small detail embraced me. Watching my friend Garry Pastore talk/act/move his eyes/laugh and then greet Michael Tota’s character when he walked over was perfectly real. There was a poignant albeit funny story going on. Director Tom Baldinger meticulously instructed Michael Tota how to grab himself while talking and then look at Vic Dibetto’s character. It had to be the same grab in every take. 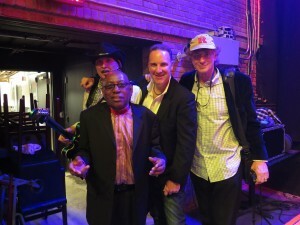 The repartee with Lenny, Bill and Garry was priceless. I’d love to use their words the next time I go to my primary care physician and see how it’s received. I savored every minute of absorption. Something else I noticed; about the crew; a special esprit de corps. They were a well-oiled machine, anticipating, performing, and functioning like the offensive backfield of a local college football team. They loved what they were doing and with whom; their director. I like to observe those elements. The body heat generated in the basement’s close quarters moved me to Main Street in Somerville for an hour until I caught up with director Tom Baldinger just before lunch. director Thomas Baldinger and Calvin Schwartz calling it a wrap. Tom smiled, took a deep inhalation and was ready to go on talking. It was I who suggested that he eat lunch but that down the road a spell, he should come on NJ Discover Live Radio/TV show with the cast and Laura Madsen and continue our chat. After a firm hand-shake cementing the deal and a photo-op of course, I was on the road again, heading to Yurcak Field on Rutgers campus with NJ Discover broadcasting the television coverage of the Skye Blue FC Professional Women’s Soccer match against Kansas City. A bunch of questions suddenly popped into consciousness on Route 287 to ask Tom and the cast. It would wait until October 5th for NJ Discover’s Live Show with them. 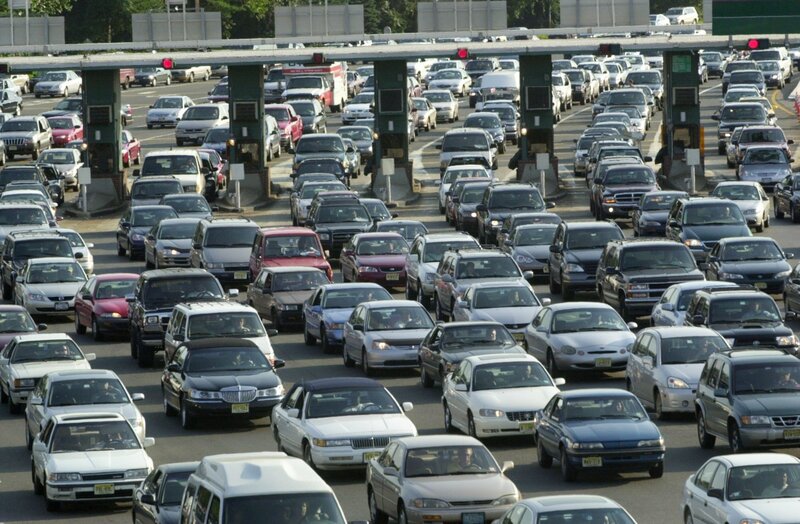 We move fast here in Central Jersey. 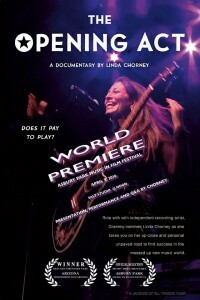 Linda Chorney is a muse of sorts; a force inspiring thought and creativity. I know firsthand. It seemed like old times; sitting down and chatting with her for this interview. 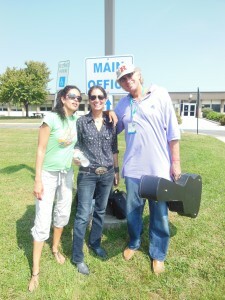 It seems like only yesterday when Scott Fadynich, her husband, invited me to hear her sing at Olde Freehold Day. That was August, 2011. Scott saw my posts on Facebook and thought I was a quirky writer/blogger, so he reached out. He is always promoting Linda. It was also my second month as a journalist. 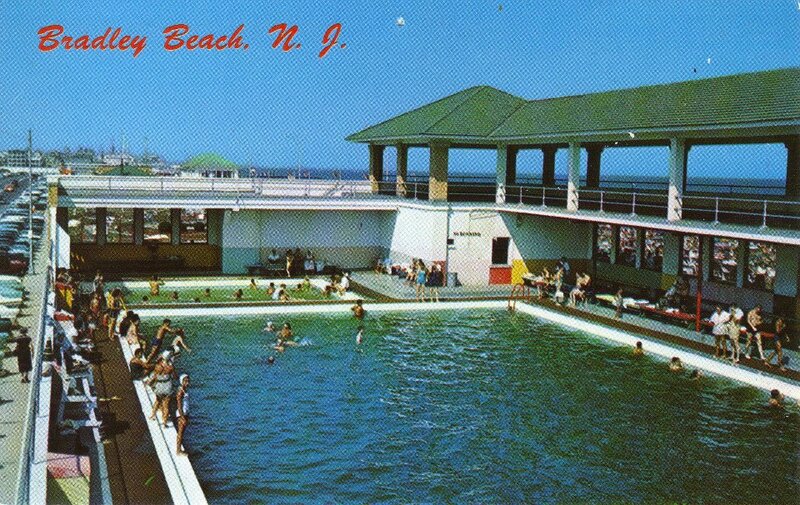 A few months later, I did my very first journalistic interview with Linda in Sea Bright, overlooking a river with Jersey seagulls flying overhead. Perhaps the birds were harbingers. 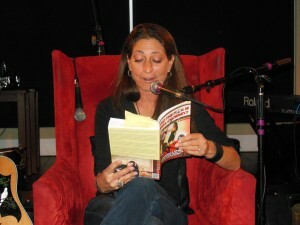 Linda’s interview that day helped to launch my new career. And now, five years later, there’s a full circle here. 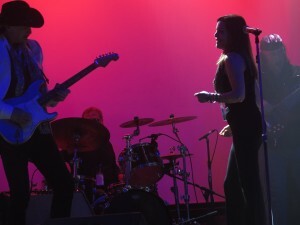 And no treatise or interview with Linda should proceed without mentioning the fact she made history for being the first Independent artist to be nominated for Best Americana Album Grammy; after playing in bars for 30 years. I told Linda right from the start of our interview that I wanted not only to share my adjectives about ‘The Opening Act,’ but it was quintessential to my thought process to highlight the unexpurgated Linda with my readers. Yes, I suppose a bit out of the ‘Private Parts’ school; people always want to hear what she has to say. I’d gladly go down the quirky question brick road. But taking a page from her book; I’m going to digress, egress, progress and jump into her movie and glittering, unique personality that radiates from Arizona to Jersey. 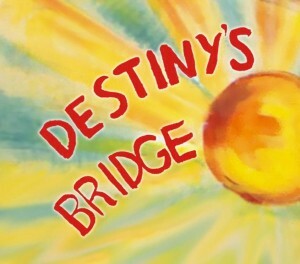 While watching the film, you feel like you are right there in the passenger seat, as she recruits friends, family, and strangers to do a new wacky music video. In typical Linda panache, this wonderful song (full of messages, but in diversionary Chorney style) is called ‘The Cantina’ which describes inane Arizona laws where you can carry a gun but can’t drink a beer in public risking arrest. Her ‘embraceable you’ personality and spontaneity invites a local mariachi band, Mariachi Sol Azteca, to partake in the insanity. They are very entertaining. You will come to appreciate her fortitude by working in 102-degree heat and many sleepless nights, as she creates. She is a perfectionist. And although you will laugh through her winging it style and journey, you may also shed a tear. I am a movie snob; totally appreciate the art of making a movie. Movies helped change my life. I’ve walked out of movies that didn’t meet my expectations or wasted my time. So in critiquing movies, I must call it as I see it no matter what. There is my need of walking away from a film with knowledge and intestinal lining feelings; emotion. I remember the scene of her waiting to hear if she’d be opening for the Beach Boys. It was weeks. She was down and said, “People have important things to do and you’re not one of them, so get over it.” This sustained her. For me a riveting quote. 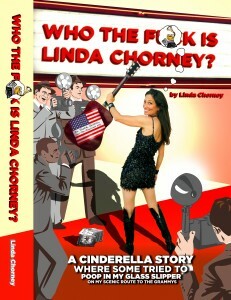 Linda Chorney made a good film. There are interviews and interviews. I’ve done my share. 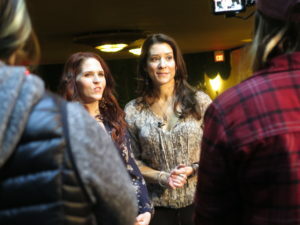 Musically speaking of course, my time spent with Linda Chorney for this interview was rare, precious and beautiful. I can’t wait for Saturday, April 9th for the premiere of “The Opening Act” at the Asbury Park Music in Film Festival at the Salt Theater at noon. She will do a little talk, a little singing and Q&A. Yes, it seems like old times having her and Scott back by the Atlantic Ocean making music and sharing passions. It’s the old proverbial; who better to write an article on memories of the Jersey shore. 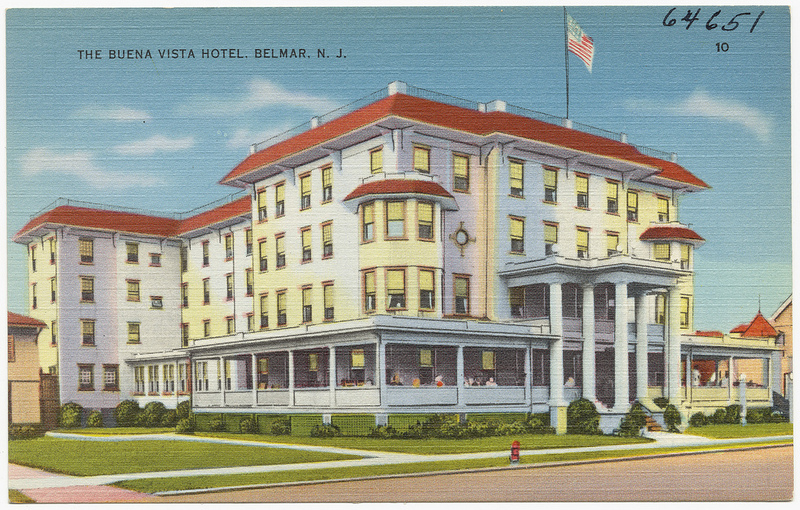 My ‘involvement’ begins before I was born, when my parents went to the Buena Vista, a Belmar hotel, for the weekend as WWII was slowly winding down in late 1944. They stayed in the attic; nine months later I arrived. 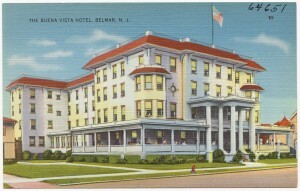 When I was ten, my parents started renting a bungalow in Belmar for August. 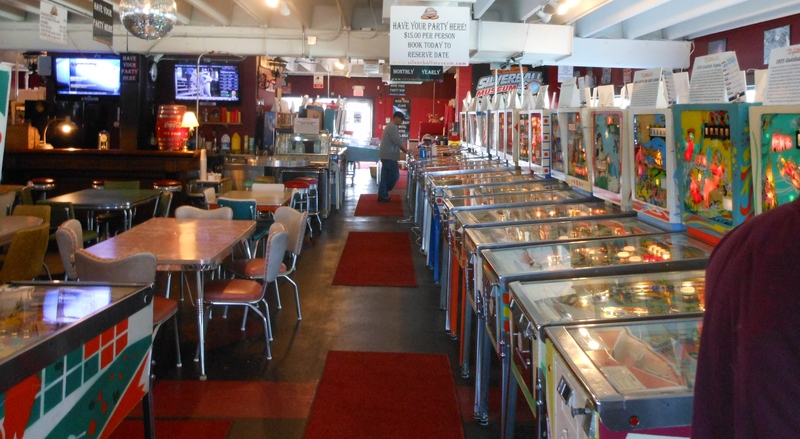 That first summer of ’55, I discovered the pinball arcade, navigating the dust underneath the machines for lost coins, the Shark River Jetty, its meditative properties and the olfactory sensations of the boardwalk, in part, which smelled like a telephone pole back in Newark. The essence of the shore begins about six to ten blocks away from the sand and beach. Somehow only in Jersey, with the flatness of the geography of shore towns, from a distance, you can see the end of New Jersey and America; the vast blueness of ocean and sky meeting. That view is priceless and exciting. It’s that first shore sighting; a giant window to memories and new daily beach badge experiences. Yes, the beach badge, with its convoluted pin affixed to bathing suit. If only a season badge someday. As I interviewed a diverse group of Jerseyans, many mentioned unique shore smells. 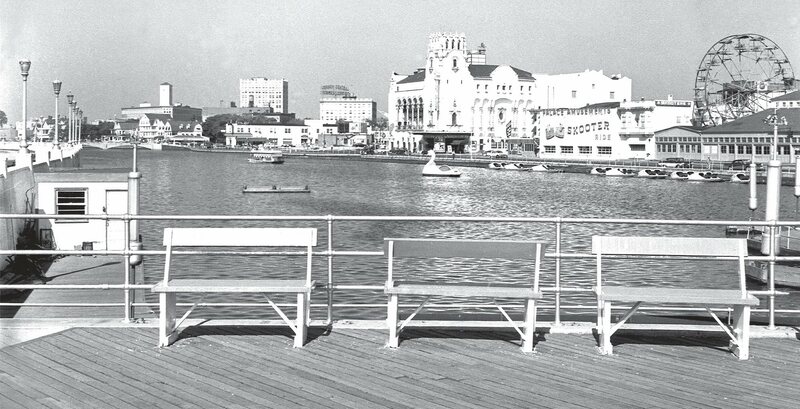 Author Karen Kenney Smith, remembering a summer week spent at Asbury Park’s Atlantic Hotel liked the “musty smell of the tired carpet.” Moist ocean air everywhere contributed. 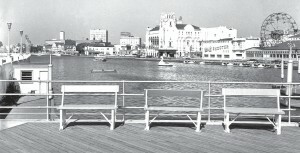 Rock on Radio personality Danny Coleman focused on the panoply of boardwalk smells. 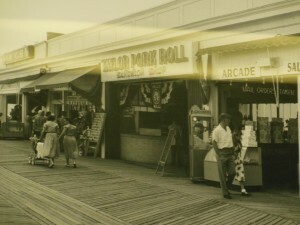 They were pure Jersey food on boardwalk smells but, “Pizza aroma was everywhere.” Musician Carmen Cosentino still loves the smell of “peanuts on the boardwalk.” He explained somehow it mixes with the salt air of Jersey’s Atlantic Ocean and has this additive effect of making you want peanuts even more. 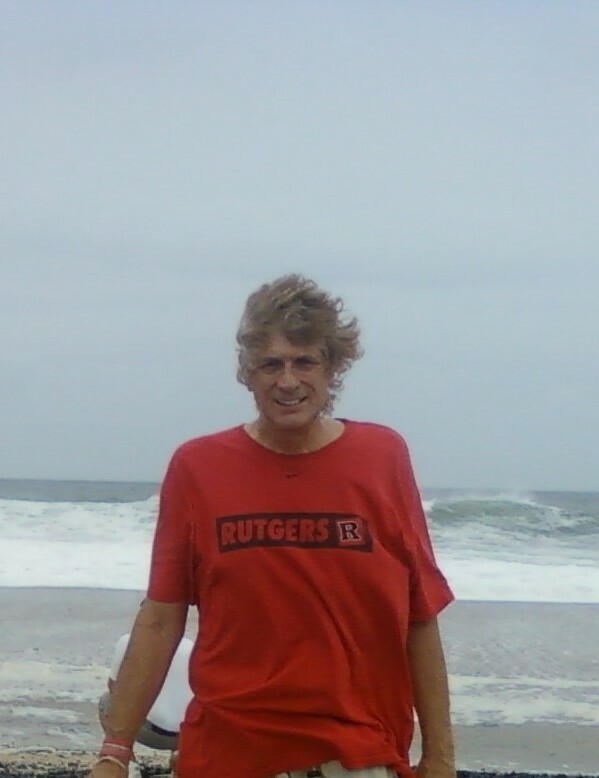 I’m not sure how I started talking about the hair-do of the Jersey shore but maybe we have our own home-grown style. Insurance industry analyst Susan Michelle’s grandmother’s friends always had their hair in a net sitting on the beach with cigarettes dangling from lips. A card game was always going on. 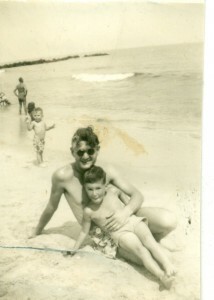 Carmen’s thought on hair, “Jersey women had the strangest hair-do; it looked like a bee-hive.” Kathy Sinnott’s grandmother left the beach every day at 3PM to prepare for happy hour. “And what happened when you left the Jersey beach to go back to your houses?” Kathy showered outside in the backyard in unique wooden showers with plank floors. It was to get rid of the sand fast. Susan used outside showers too or sometimes just a quick hose down on the back lawn covered with neatly manicured weeds and occasional crab grass. Food is Jersey definitive. Everyone remembers. It was the Good Humor ice cream truck. For me in the 50’s, it was a bakery truck driving up and down the beach streets with bread and cake stuff out of the rear. I heard recollections about Syd’s, Vic’s, Zelbe’s, Max’s and The WindMill for hot dogs. Despite the admonition of Thomas Wolfe that you can’t go home again, The WindMill is still purveying hot dogs today. 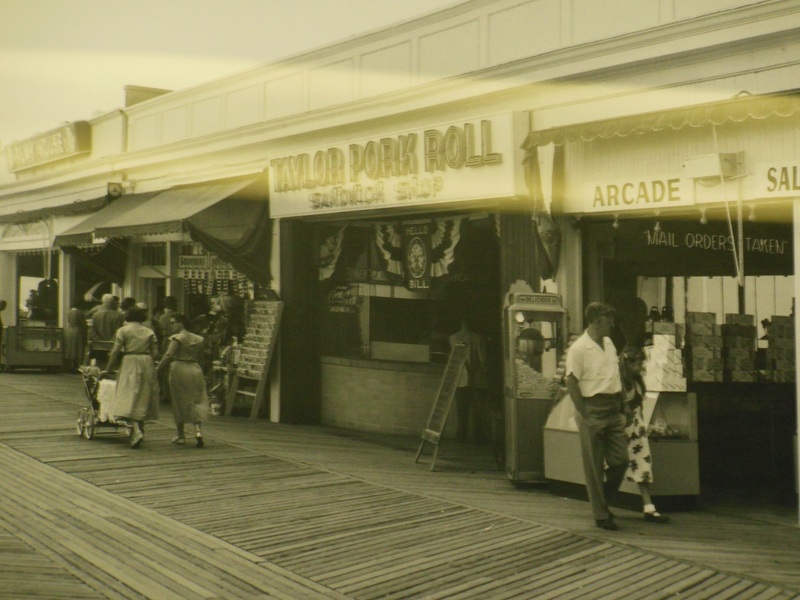 Also mentioned as a memory were soft-shelled crab sandwiches and salt water taffy right out of the local ocean; it tasted better indigenous. Kohr’s Custard in a cone; Karen once dropped her cone and to this day it’s always in a cup for her. 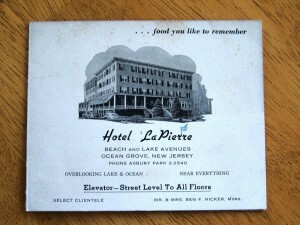 Sandwiches were always taken to the beach, sometimes packed in shoe-boxes. French fries came in brown paper bags with small wooden forks and vinegar instead of ketchup. 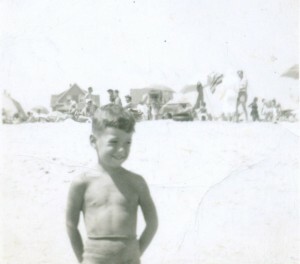 Pondering a good visual to portray the Jersey shore when I was listening to the Everly Brothers sing ‘Bye Bye Love’ in 1955, I just thought of the movie ‘The Summer of ’42.’ Jersey shore was small towns, simple beach structures, like on the island in the movie. Stores were basic and general. Painted paper sale signs hung on windows; beach chairs and umbrellas on the sidewalks creating impulses to buy. Movie theaters boasted they had air-conditioning, were mostly double feature and had that beach dank damp smell. I want to say I saw ‘Now Voyager’ starring Bette Davis down the shore one summer. Some towns were regal with their Victorian architecture; I’m thinking Ocean Grove and Spring Lake. 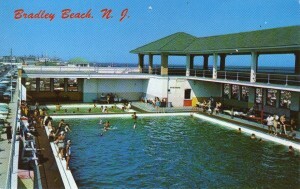 Jersey shore is old and historic. There’s a paradox to the crowds and long lines of summer; the solitude and introspection of the winter months at the Jersey shore. Some towns turn off traffic lights in winter. Back in college, I used to get the key to my friend’s beach house in Bradley Beach and go there to study. It was cold but eerily quiet and productive. 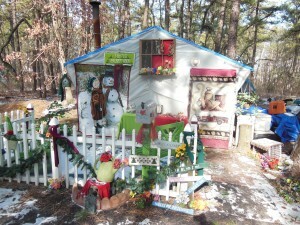 David McMahon, from 40 Foot Hole Studios, would rent a shore house for the winter for its ultimate peace and solitude. “I love the winters down there. 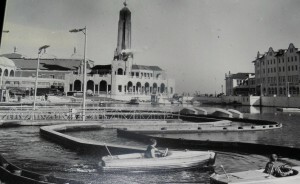 I’d just bundle up and sit by the ocean.” That’s the other side of the shore; the down winter time; something which provides a unique identity. You can be in a state with eight million neighbors but find this spiritually special desolate shore place in a world all by itself with few winter neighbors and even fewer year-around pizza establishments. 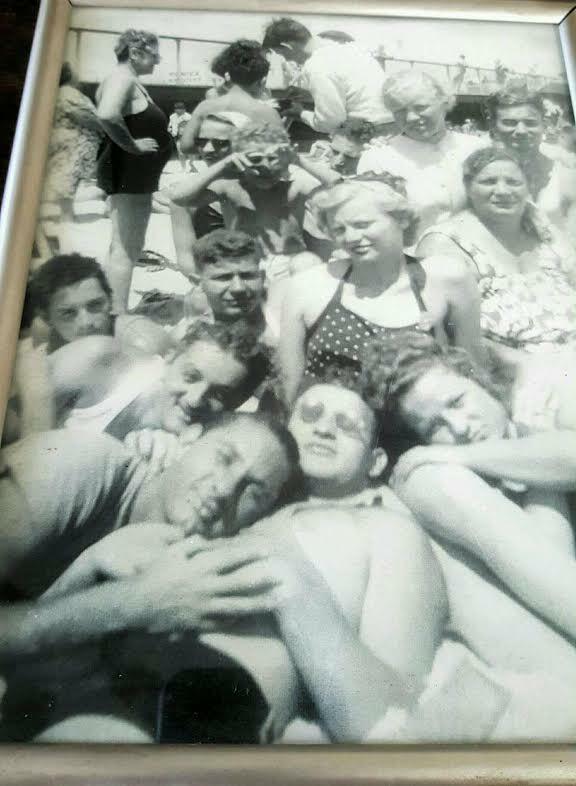 And finally what is that common denominator that makes the Jersey shore unique, memorable and passed down from generation to generation? 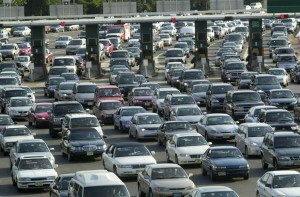 It’s the people of Jersey who’ve won their independence from New York and Philadelphia these past years. New Jersey is hot culturally and media wise. Just look at national pop culture; The Soprano’s, Boardwalk Empire, Jersey Shore, Jersey Housewives, Garden State, Jersey Boys; and of course Bruce Springsteen and Jon Bon Jovi globally. What really is that bond that puts the whole state together then and now; that matrix of shared pride and experience; that place we all rushed to re-build after Sandy and showed our resilience to the world? It’s the Jersey shore. And I still remember it like it IS yesterday.